Dining in theme parks is never an easy task. Either the food isn’t great or it costs a small fortune. As a 17-year-old who goes to the parks alone and is on a rather small budget, I prefer good food at a good price. While I do enjoy a good churro or bag of popcorn, when I’m at Disneyland, sometimes I need a real meal to satisfy my hunger. 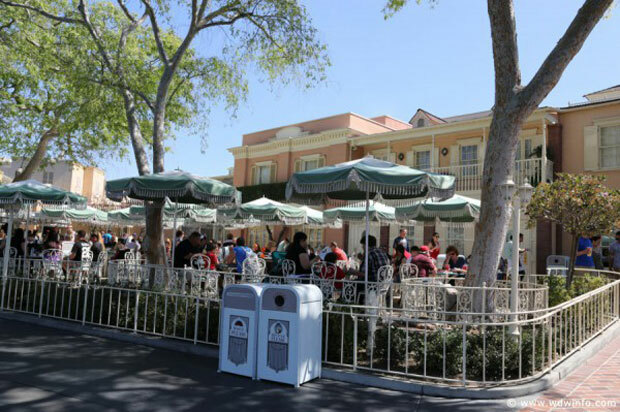 There are, of course, the big names such as Blue Bayou or Carthay Circle, but those are rather expensive and it’s a bit awkward to eat at these restaurants alone. Some of my favorite “budget dining” options at Disneyland may not have the best food ever, but it beats most theme park food and won’t take a bite out of your wallet. Here are my top 5 choices. Right next door to the Golden Horseshoe, overlooking the recently refurbished Rivers of America, is the Stage Door Cafe. While hidden and small, this dining option is a great quick option when pressed for time. The food options include Fish & Chips, Chicken Breast Nuggets, and House-made Funnel Cake. The seating is entirely outdoors, and while it is fairly accessible throughout the day, crowds in that area tend to pick up around sunset. 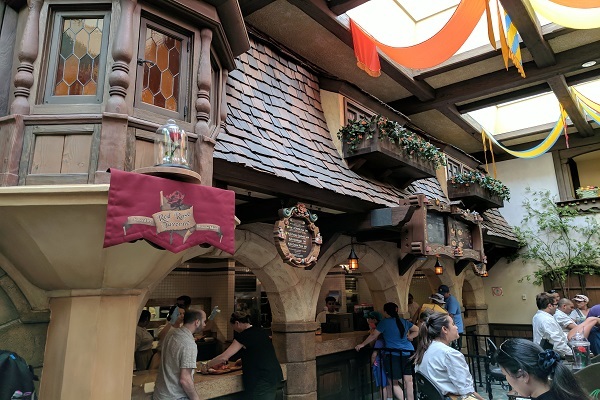 This next choice was my favorite when I was younger, and even though the food is only okay, it’s in a convenient location and features a nostalgic interior for Disney enthusiasts. 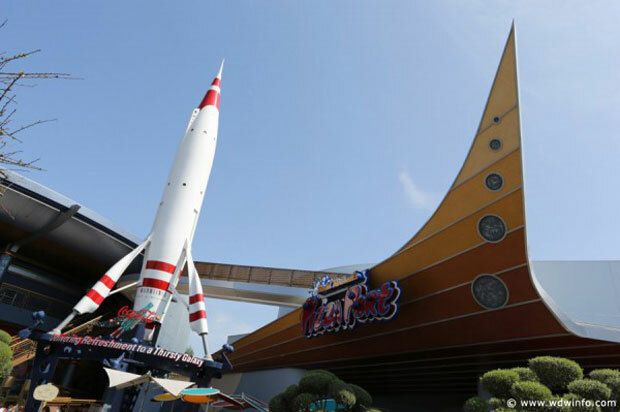 While mediocre pizza, pastas, and salads are the highlights of the menu, the Pizza Port‘s decor is made of old Tomorrowland attraction posters, and the majority of the dining space is in an indoor patio near the entrance to Space Mountain. This option is actually three options, all around a central table space. The complex is made of a Mexican cantina, Chinese options, and a bakery serving up soups and other bread related eats. This is also where you can grab a quick adult beverage, be it a margarita or locally brewed Karl Strauss beer. 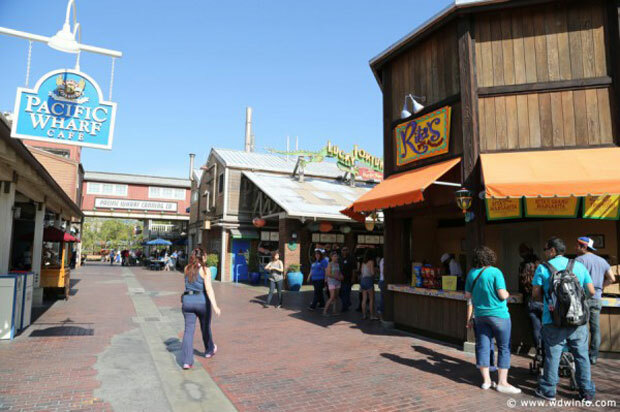 The Pacific Wharf is also home to the Boudin Bakery Tour and the Ghirardelli Soda Fountain and Chocolate Shop, where you can get a free sample of sourdough bread and various ice creams and chocolates, respectively. The Red Rose Taverne was originally intended to be a temporary endorsement for the live-action release of Beauty and the Beast, but has since become so popular it might last longer than originally intended. The menu features burgers, flatbreads, and poutine, along with possibly the best Disney dessert ever, the infamous Grey Stuff. While the line is sometimes out the door at peak hours, the wait is usually no longer than fifteen minutes and worth it. Finally we come to the number one budget option for decent food at Disneyland. 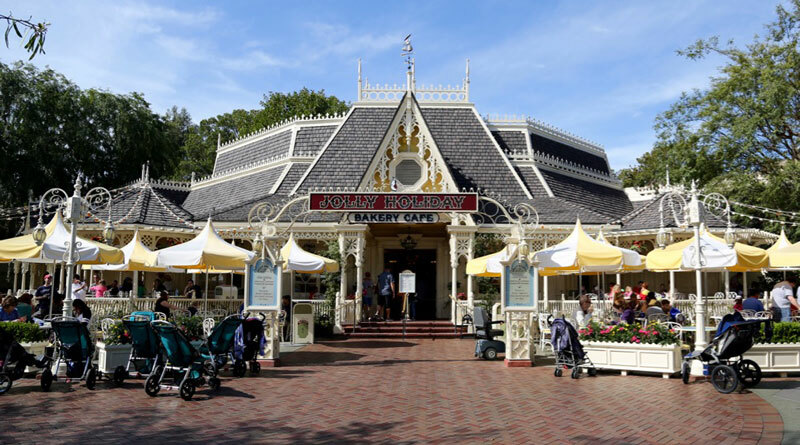 The Jolly Holiday Bakery is next door to Refreshment Corner, right by the entrance to Adventureland. This location boasts a large assortment of baked goods and desserts, along with different sandwiches, soups, and salads. However, the most ordered option is the Jolly Holiday Combo, featuring half a grilled cheese sandwich and a small cup of tomato soup. Also, be sure to time your meal here so that it does not coincide with a parade or fireworks, as seating will be near impossible to find. While there are many more options for inexpensive food at the Disneyland Resort, these are just my personal preferences. I always tell everyone to have their own experiences and make their own favorites, but I hope these will get you started and help on your next trip to the Happiest Place on Earth!